We wanted to find out what life was like for the more than 180,000 Australians who live in a retirement community, so Starts at 60 spoke to current residents around the country to get their personal experience of community life. Rosemary Costello, 75, and her husband Derek, 78, sold their Brisbane acreage home to move into a nearby retirement village five years ago. They’d decided the upkeep on their property was too much for them to handle and wanted to move to a safe, secure community. Rosemary explains how the friendly interaction of retirement living has become her “anti-ageing strategy”. “It would be very easy, especially if you lived outside a village, to become fairly isolated and fairly self-centred as you get older, but living here keeps us younger. It keeps us interested. “People are incredibly friendly but nobody is intrusive. You don’t have people knocking on the door or wandering in and out all the time. There’s just more of a sense of neighbourliness, generally keeping a little bit of an eye out each other. Elsewhere, half the time people don’t even know who lives in their street. “There’s so much to do here. For me it’s a bit exacerbated because I’m the president of the residents’ committee, which is a group of people elected to liaise with the village’s management on behalf of the residents about various issues related to the village. 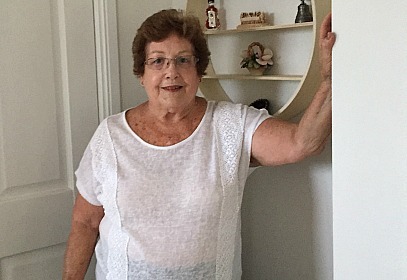 Rosemary Costello, pictured above, says her activities, including acting as president of the residents’ committee, sometimes keep her a little too busy! Source: Supplied. “I think we’re looked after very well. We’ve got three maintenance men who are superb, who go out of their way to help. We’ve got a good group of gardeners. We’ve got good staff and managers around us – people who listen and who respond to our needs. “Along with the residents’ committee, we have a social committee that’s incredibly active. We have monthly dinners from an outside caterer and the average attendance of those is 100 to 130 [from about 300 residents] because people love the chance to get dressed up, go out and have a nice meal and entertainment. “We have what we call dine-ins, where you pay $10 for pizza and ice cream and just get together. We have film nights and matinees, morning teas, concerts. And there’s an ecumenical church service every Saturday morning where we bring in ministers of different denominations and we can have 50 people there on a Saturday morning, which is a really steadying thing for the life of the village as well. “There’s also a group that organises trips so there’s a group of us going off on a cruise to the Melbourne Cup. “There’s tai chi, hydrotherapy, yoga and exercise classes, craft groups, cards groups and bridge. Talk Fest once a month brings people in to address the group on educational or interesting topics. Every Friday night we have drinks at happy hour, with 50 people or so down there. The drinks are relatively cheap and we supply nibbles and a little raffle. “We’ve got the buggies that are available to transport people to things if they can’t get there on their own. “It’s up to us as the residents’ committee to engage with our new residents when they come in. [We] let them know what’s available and encourage them to take part. It’s a matter of doing it sensitively, though, so you’re not crowding people, you’re giving them time to settle in to their own space but also giving them the chance to integrate into what’s going on. “Coming here meant we didn’t have to change anything. We only lived 10 minutes up the road before moving to the village so we still shop at the same place, still go to the same church, our doctors are still the same. “I think men are sometimes a little bit more reluctant to make the change to a retirement village but Derek’s settled in really well. I think the fact that our unit is three-bedroom and nice and open, there’s greenery everywhere and there’s enough garden to keep us occupied, has helped. “We have grandchildren coming here four days a week and the whole family comes for dinner on a Monday night. Have you experienced life in a retirement village? Have you considered visiting one to check out the lifestyle?